There appears to be a bug associated with Traya cleanse after new update. 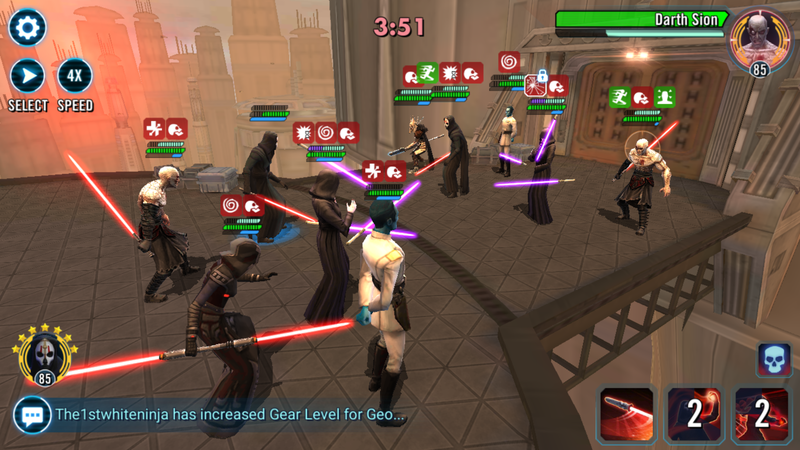 If there is no fleet combat in Grand Arena, does that mean the matchmaking will only consider character gp? I have a higher ship to character gp ratio than a lot of people. Even if it goes by character gp I'll still be at a disadvantage due to the characters I've geared who are only worthwhile as crew members, but if matchmaking uses total gp it will really hurt. why not move to next phase after win or lose? like in tb: what's the point in waiting when all stars are done including all members have done special mission? @Rottweiler666 this isn't like TB content, it's like TW content. You may have done all your battles in the first hour, but you have to wait for me to do mine too. Maybe he had it at the start of his turn, so Sion taunts, then buffs are removed via Traya's lead? There were other instances as well where debuffs were not appearing to be properly cleansed. I am finished with arena for today, but will see if I can capture others to show. But, I have never had issues with this in the past. I.e. DN had debuffs, all were cleansed at the start of turn, Sion did not have taunt prior. Traya is cleansing Pain from Sith allies at the start of their turn due to her Unique Ability. The enemy Sion is triggering taunt at the same time at pain is cleansed. Your Sith ally had Pain at the start of their turn but it would be very hard to see visually since it happens almost instantly. This is how I always thought it should work. But up until recently it hasn’t worked this way. Did that just change today? My major question is why does the tie go to the player with higher GP? Logic would have it that the player with the lower GP played better if he/she tied the higher GP player, so they should get the win. Don't give it to the one who started with an advantage. It appears that way. I just fought my first post-update arena battle and I had the same thing. Now my cleansed sith still face a taunting Sion. This is a game-changer for Traya v Traya matches. Sion is so much more valuable now. Interesting that you called their logic into question. Let's say you've spent millions of dollars to develop a game called Stellar Battles: Competition of Champions. In this game, you earn money by players buying and acquiring characters and gear on their way to the top. Logically, would you want to provide incentive for the players to have more or less of these items? Still, 3v3 sounds like the perfect matchup for just putting the Trio on defence and never losing? The trio could beat the meta even against 5... heh. Looks all interesting, just wish the matchmaking was based more then on GP. This is a definite change from previous behaviour if it's the case. Can we get a confirmation if Sion is keeping his 100% defence and 100% tenacity as well as the taunt? Surely you are aware of how guilds skirt GP matchmaking by leaving out a member, giving them a more favorable matchup. Are the new matchmaking rules going to end this exploit of the system? Second, GP seems an unbalanced manner to gauge opponents because you can have an even number of GP and highly uneven matchup of teams. For instance, I was in a 130gp guild that could not clear phase 1 of the HSTR. Guilds with significantly less GP now clear this raid because their rosters are tailored for it. 3mil Vs 3mil is NOT necessarily an even match up. How has this extremely obvious issue been addressed in matchmaking? Or is the “win count” supposed to handle that? Do “win counts” carry over to future events so more powerful 3mil accounts face higher GP opponents, or 3mil accounts which land in their win count range? This is important because winning always means better rewards, and 3mil GP whales should not get to face 3mil GP FTPs if the rosters are not actually even. Such a case would just throw it back into the tournament debacle. I could care less about titles. I do not like the game dictating what chars I have to get to gear 12. I said pass to this a long time ago. Getting burnt out on the teasers kinda, loot boxes, gotta wait its getting to the point I don't pay attention anymore. Didnt follow the C3P0 stuff this time either, it was fun at first now its kinda old. BUT shout out to those that still enjoy and take the time to decipher it, it's much appreciated just burnt out on forums stuff. Will the gear reward vary over time? Currently have mk5 droid callers as gear reward. Any one have different variation of gear rewards? @CG_SBCrumb I know that this update is being worked on to be pushed out. Is there an approximate ETA? Just curious as I'm climbing for my arena payout and want to time my battles properly around the update. Thank you for your hard work sir! When is the update going for iOS ? What? You aren't working with anybody. This is a purely competitive game mode.